Suitable for applications requiring skin protection, cushioning, and long wear time, a hydrocolloid adhesive product resists breakdown from exposure to body fluids and other moist conditions and remains intact and pliable for up to seven days. The nonirritating synthetic formulation does not support growth of microorganisms and allows skin to breathe and function normally. 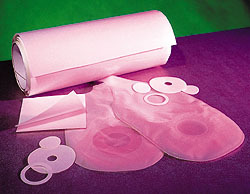 Uses include products for ostomy, incontinence, tracheostomy, prostheses, and cushioning. 3M Medical Specialties, 3M Center, Bldg. 275-4E-01, P.O. Box 33275, St. Paul, MN 55133. Phone: 800/228-3957. 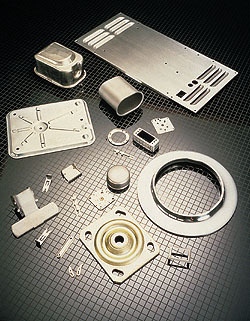 A contract manufacturer provides precision metal stampings to the medical device industry. The firm has expertise in wire EDM, jig grinding, and CNC machining and can design and build progressive dies, custom rubber molds, and plastic injection molds. Short and long production runs can be accommodated. Straton Industries, 180 Surf Ave., Stratford, CT 06497. Phone: 203/375-4488. 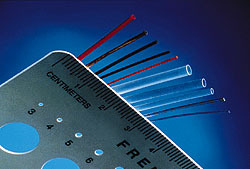 Multilayered sheath tubing offers walls as thin as 0.002 in. Offering good kink resistance and coefficient of friction, a line of multilayered sheath tubing includes a variety of inside diameters and walls as thin as 0.002 in. The tubing comes in a range of colors or in a radiopaque version and can be bonded with other thermoplastic materials for multiple uses. The company offers assembly and testing services in a Class 100,000 cleanroom facility. Putnam Plastics Corp., 130 Louisa Viens Dr., P.O. Box 779, Dayville, CT 06241. Phone: 203/774-1559.